This hostel is really great! It's in Casco Viejo so close to where everything is happening in Panama city. The rooms and showers were clean and the beds have curtains so you have a bit of privacy in the dorm. The atmosphere was good and there were enough people around to mee. More ++ were: free use of a towel, some nice free tours, free breakfast and $1 beers. Best hostal of Panama City! Nice atmosphere and rooms with AC. The staff is really friendly and helpfull. Do the Free walking tour with Chris! An amazing guy who shows you around and is eager to help. Absolutly loved it here. Best hostel of my trip!!! The staff is super friendly and love to help you with everything. The beds are very comfy and have curtains. They offer free towels! The bar downstairs is awesome! But no problem with noise if you wanna go to bed early. Must go!! Fijn hostel. Locatie is top. Kwamen snachts aan en werden netjes door de beveiliger binnen gelaten. Personeel heel vriendelijk en behulpzaam. Prima dorms. Nice hostel. Perfect location in old town. Clean. Great location, huge dorms and comfy beds. Can get pretty warm though. I stayed on friday And saturday And the backyard is pretty much a club. If you join the fun it is no problem though :) But I can imagine people that want to sleep would find it way too loud. Best place in PTY! Very nice staff, very helpfull! Only some crazy people pretending to live there can be annoying. Perfect location in the old town of Panama City, Casco Viejo, located on top of Relic bar and restaurant Nomada. At the end of the street you can enjoy a view of the modern skyline and Just around the corner is a small 24 hour supermarket. The staff at the reception is friendly and helpful, the dorms are comfortable with airconditioning and curtains for each bed. In the communal areas there is a nice atmosphere which is also present in the Relic bar (part of the hostel). Very Nice hostel With staff that was always happy To help you out or To get information for you! The pancake breakfast is simple but nice, there could be some more showers ( 3 for the whole upper floor) and if you are staying on the first Floor you could have some noise from the bar downstairs. 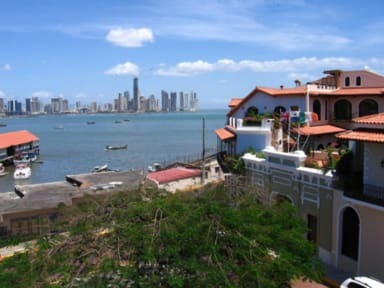 It was the perfect place To discover Panama City from and i would definitly recommand everybody To stay in Casco Viejo and in luna’s Castle specific!